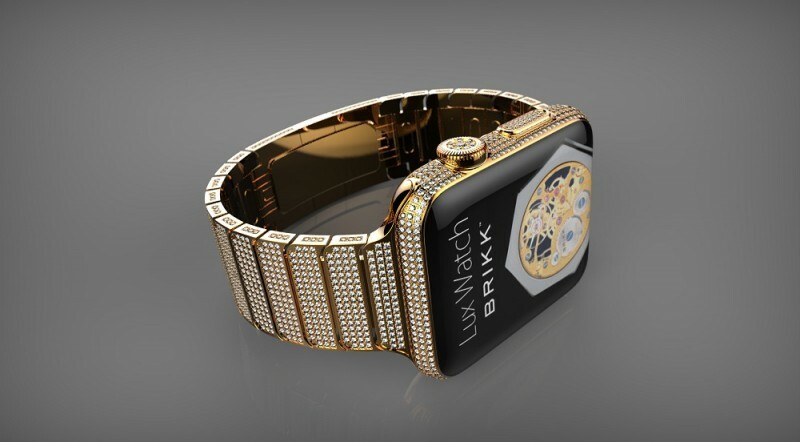 Brikk Announces Diamond-Studded Apple Watches Costing Up to $75,000. The basic Standard edition offers a single row of diamonds (.50 carats) and a leather strap, while the mid-tier Deluxe has multiple rows of diamonds (2.3 carats), diamond encrusted buttons, and a diamond studded clasp on its leather strap. “For the ultimate in exclusivity,” Brikk offers the Lux Watch Omni edition with a fully diamond-emblazoned case resulting in over 12 carats of jewels on the device. The company promises only the highest end of luxury and satisfaction in purchasing one of their new line of high-end devices, which they’ve done before with the iPhone 6 and 6 Plus. The Lux Watch line stands out thanks to its meticulous production processes. Each piece is disassembled inside Brikk’s state-of-the-art laboratory in Los Angeles by a team of skilled engineers. They are hand polished, then plated with five layers of diverse metals before their final plating in either two layers of gold or platinum. High quality diamonds (color D, clarity VVS1) are set with a microscope in a custom-machined bezel. Each piece is then reassembled and tested before shipping to clients. The line will set those interested back $7,495 for the Standard, $11,995 for the Deluxe, and $69,995 for the Omni, and all prices fluctuate slightly higher for larger sizes. Brikk promises that each comes in a “Zero Halliburton aluminum case with carbon fiber interior”, with a user manual, the expected accessories, a 1-year warranty, and a diamond-studded certificate of authenticity. While Apple has taken a decidedly fashion-skewed angle in beginning to market the Apple Watch, Brikk’s new diamond-encrusted offerings appear to be a more straightforward answer to those looking for more of a statement with the new wearable. Pricing guesses have jumped between $10,000 and $20,000 for the high-end Apple Watch Edition, so while the Lux line’s lower-end models could fall in line with Apple’s own mid-to-upper tier models, the Omni edition offered by Brikk may in fact be the most expensive version of the Watch on the market when the device launches this Spring. Those interested in the Lux Watch line can visit Brikk’s official website to place a pre-order, which requires a deposit and is expected to ship between 4-6 weeks following the official Apple Watch launch in April. This entry was posted in Apple news and tagged apple, Brikk, Watches. Bookmark the permalink. Apple Maps adds animated landmarks like rotating London Eye and time-telling Big Ben. Apple Watch will eventually replace your car keys.